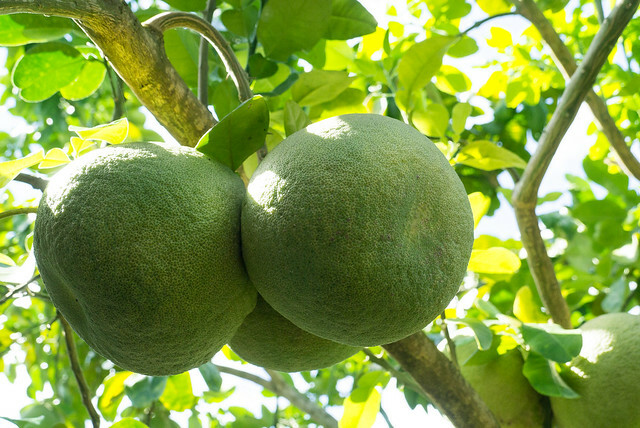 The pomelo (citrus maxima) is the largest member of the citrus group. Its native to south and southeast Asia. In some english speaking countries its also known as the Shaddock. Confusingly in Latin America pomelo often means grapefruit so the distinction between the actual pomelo and a grapefruit is very blurred. When ripe its pale green to yellow and can range from 10-30cm in size. It has white to pinkish flesh and a characteristic very thick albedo (rind pith). The inner skin is where most of the nutritional benefits are found. Its flavour profile really depends on the type and level of ripeness. It can range from sourness to mild sweetness. The rind is smooth to rough in texture with soft flesh very similar to a grapefruit. It has citrus and tangy notes and is quite fragrant. The big difference between the pomelo and grapefruit is that its less bitter. Pomelo is a good source of Vitamin C, high pectin levels and is said to lower cholesterol levels. Pomelo is often eaten raw combined with a little sugar to balance its flavour. Its popular as a dessert, added to salads and mixed with yoghurt. A really interesting pairing of pomelo is with tamarind in the spicy Thai salad Yam Som-o. In China the peel is used as a flavour enhancer. 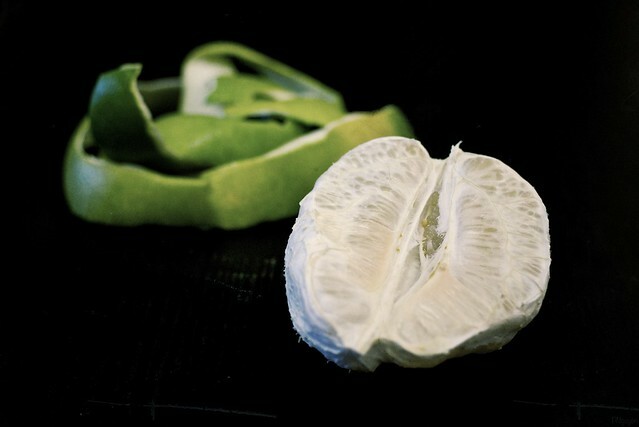 Combining pomelo with other sharp intense flavours really can creatre interesting results. Try it with chili, orange, lime, pomegranate, fish sauce, soy sauce as well as with more mellow ingredients like scallop, prawn, cucumber, lychee and crab. Pomelo’s that feel heavy for their size is usually a good sign of quality. If the flavour profile is acidic and tart combine with other sweeter ingredients to balance.